"My second visit to Trailworld and it definitely won't be my last. Words like awesome cannot really describe how great the experience of riding in this terrain was. The river sections, loose rocky and dusty trails, all superb. Trailworld staff's ever-professional attitude always makes you feel at ease on the trails, whatever your ability. The Trailworld accommodation is excellent, and Fran did a great job of looking after us (special thanks for the birthday cake and bubbly!). Would I recommend Trailworld? Definitely. Would I go back? Just try to stop me! I live in Spain, so am lucky enough to be able to do one day tours, this was the second time I've been, and won't be the last. I took a group of 8 mates with me, with different abilities, which makes no difference to your day as you ride at your own pace, and we all agreed what a fantastic way to spend a day, And would love to do a longer stint next time. A very big thanks to all the staff at Trailworld, an experience we won't forget in a hurry. "The best time we have had ever on bikes the people the food the full on adrenalin buzz cannot say one bad thing about the whole tour if you havent been go we want to go back already"
My first taste of off road biking at 57 and I was talked into going for a week ! I needn't have worried though - Trailworld did a first class job of looking after us all and although the old bones were sore at the end of each day, a few beers in Trailworld's stunning accommodation, sitting by the glistening blue swimming pool gave me a warm, contented glow. Thanks to you all at Trailworld - what a great week!! I will be back! I recently spent 3 incredible days riding trails in Spain with hubby! Steve, who was our guide for the 3 days and his wife who supports and helps run the show back at base, were very welcoming and made the short time we were there very enjoyable. They're a great team and run a great set-up. The accommodation, and of course, the trails were fantastic. 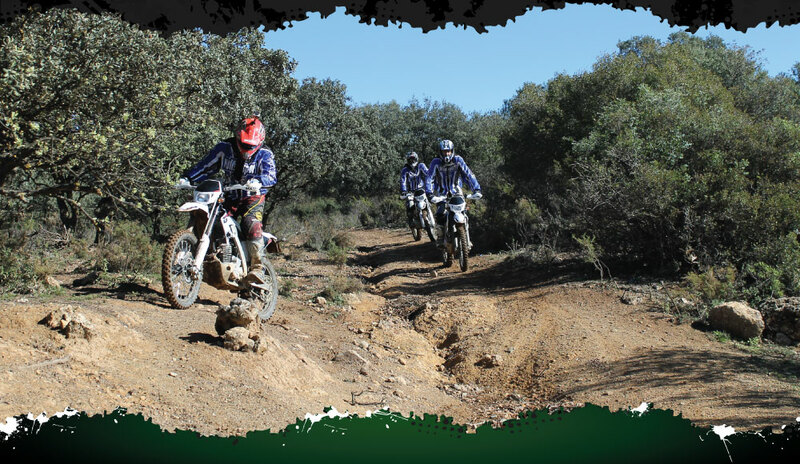 We'd thoroughly recommend Trailworld Spain to anyone and everyone if you fancy some time on two wheels in the sunshine. We chose Trailworld Spain with a view to improving my very limited trail riding experience (2 days) in some sunshine. My abilities came on leaps and bounds over the short time we were there, helped by Trailworld's staff patience and reassurance when it came to some trickier sections. Can't wait to do more! The local village is lovely with great restaurants for eating out. It's not too touristy so you get to see a bit of real Spain not spoiled by mass tourism. Three great days spent with Trailworld, both out on the trails and back at the Farmhouse.